A box of Polaroid Land Infrared Film turned up on eBay a few months ago. I wasn't aware that such a thing existed but there it was, and the seller kindly included photographs of the packaging and the data sheet. The film was reportedly available between 1964 and 1969 (the data sheet shown was dated May 1967) and was designated Type 413. It was a black and white film sensitive between UV and just beyond 900 nm with a peak at 830 and a trough at 510. Equivalent ASA rating was 200 with a Wratten #87 rising to 600 with a red filter and 800 with no filter. If anyone knows of any examples taken with this film please let me know. You are probably aware of Simon Marsden's atmospheric infrared photographs of ruins and other settings with a supernatural ambience. 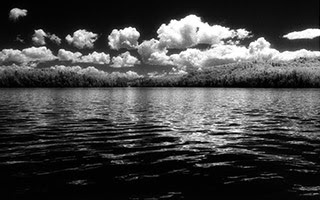 He uses Kodak HIE infrared film, with its characteristic grain and halation, and usually photographs with strong back-light to increase the day-for-night effect. 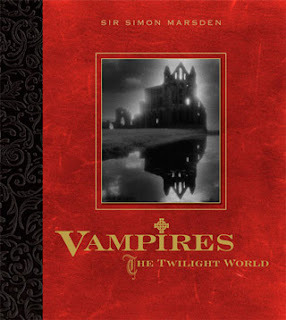 Simon has just circulated an email about his next book, due to be published in the UK and USA in October, entitled Vampires: The Twilight World and published by Palazzo Editions. I have to say the cover is stunning, and Whitby Abbey is one of those places of which I've always wanted to take an infrared photograph. Signed copies will be available (signed by Simon I should add ... in case you've been watching too much Twilight) from Simon Marsden’s website from 1st October 2011: www.simonmarsden.co.uk.